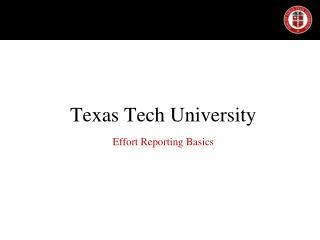 Effort Reporting Texas Tech University What is it? 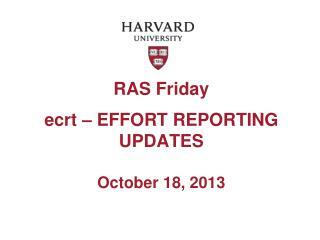 Effort reporting is an accounting of effort on sponsored agreements, both paid and unpaid. 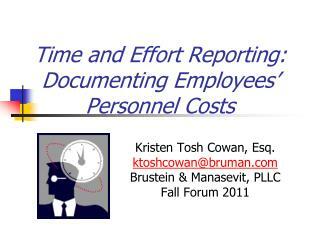 Verification that direct labor charges are reasonable and reflect actual work performed. Why do we have to do it? 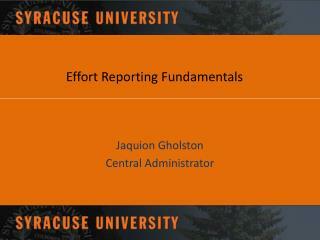 Effort reporting is an accounting of effort on sponsored agreements, both paid and unpaid. 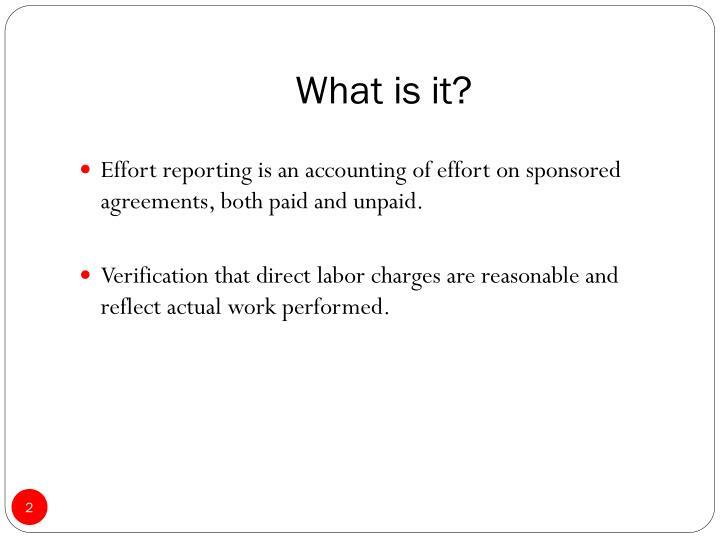 Verification that direct labor charges are reasonable and reflect actual work performed. Federal and state laws require it. 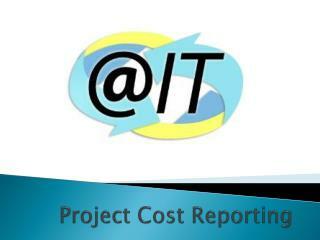 It is our only means of documenting salary charges which are cost shared. 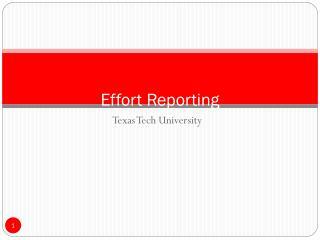 Failure to complete the effort report leaves TTU in jeopardy of disallowance of salary costs on sponsored agreements. 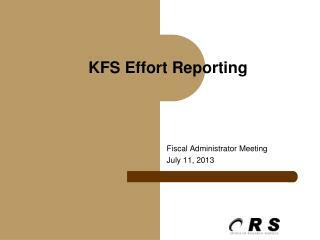 Missing or incorrect effort reports can jeopardize future funding for the University. 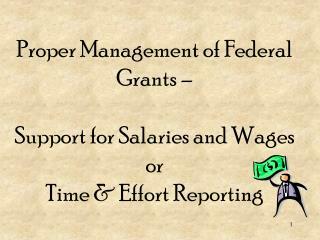 You have indicated that you will expend effort on a project funded by federal, state or private money (cost share). 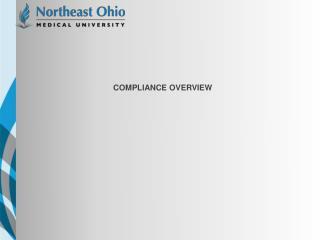 Summer Semester - June 1 through August 31. 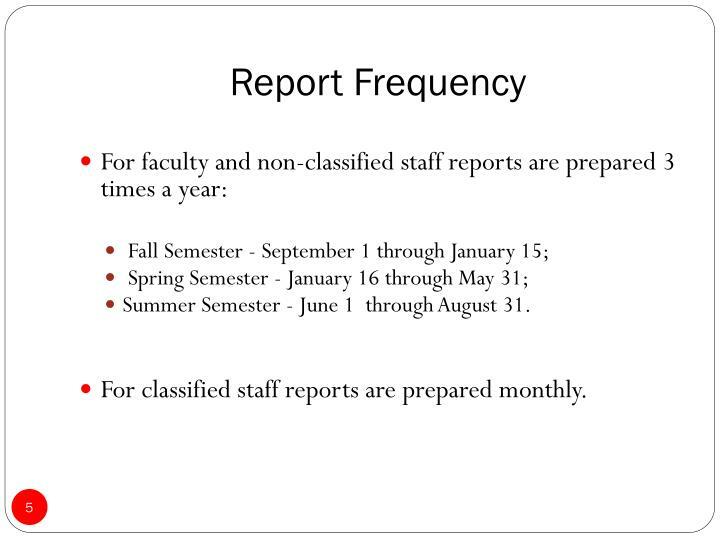 For classified staff reports are prepared monthly. 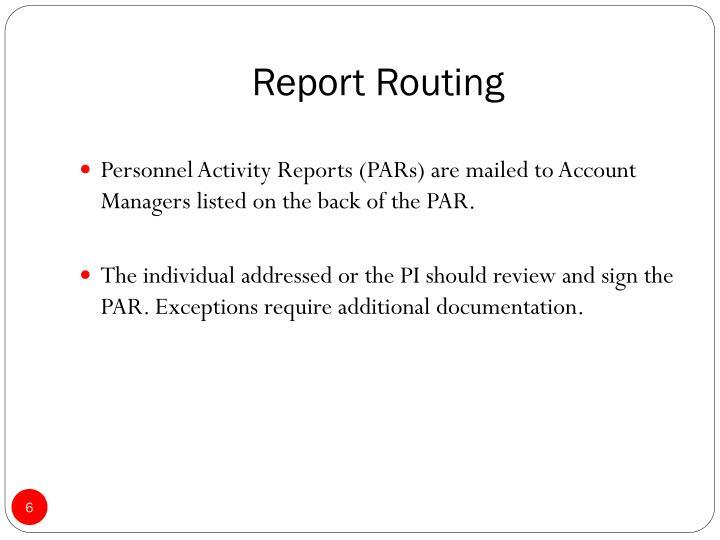 Personnel Activity Reports (PARs) are mailed to Account Managers listed on the back of the PAR. The individual addressed or the PI should review and sign the PAR. Exceptions require additional documentation. Faculty and staff salaries charged to sponsored research projects should be commensurate with the direct effort provided to the project. 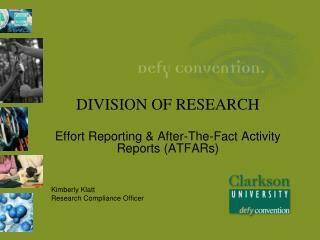 Salary charges to sponsored research projects must not include administrative work or activities related solely to instruction or departmental research. What are the Pre-Printed Percentages on the Form? 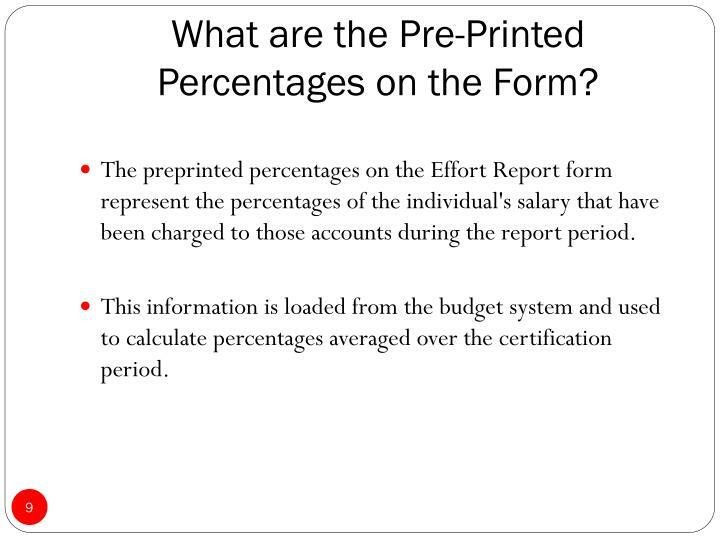 The preprinted percentages on the Effort Report form represent the percentages of the individual's salary that have been charged to those accounts during the report period. 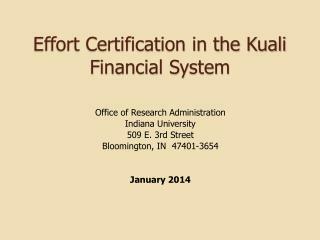 This information is loaded from the budget system and used to calculate percentages averaged over the certification period. 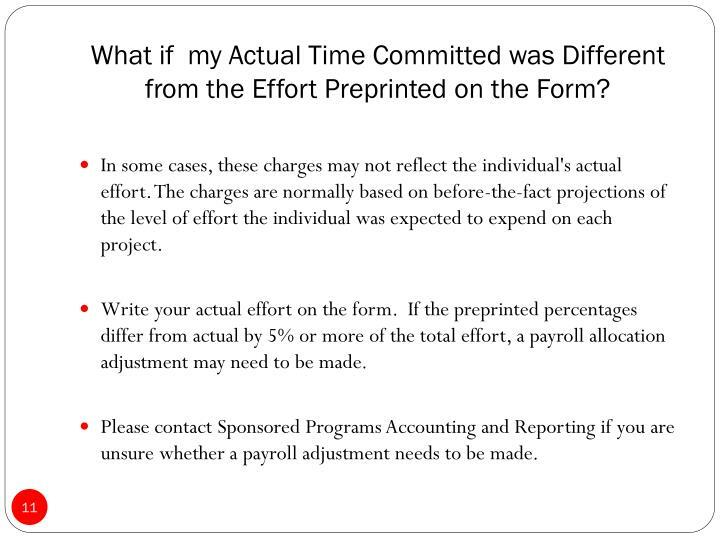 What if my Actual Time Committed was Different from the Effort Preprinted on the Form? In some cases, these charges may not reflect the individual's actual effort. 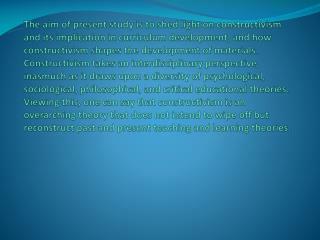 The charges are normally based on before-the-fact projections of the level of effort the individual was expected to expend on each project. Write your actual effort on the form. 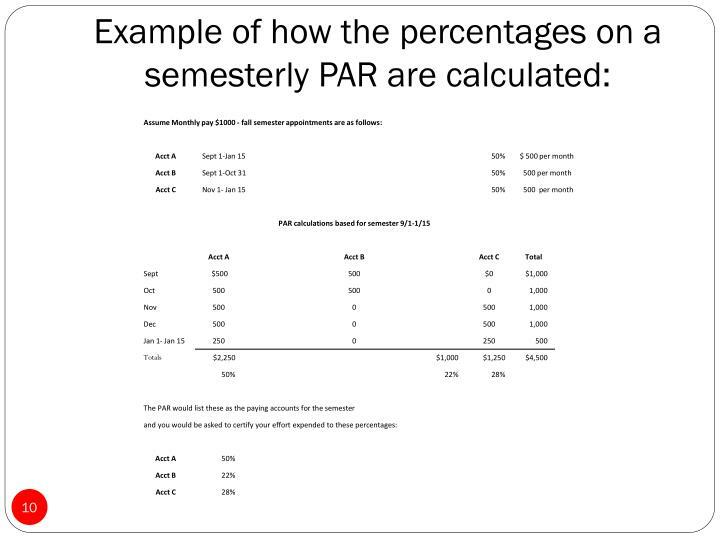 If the preprinted percentages differ from actual by 5% or more of the total effort, a payroll allocation adjustment may need to be made. 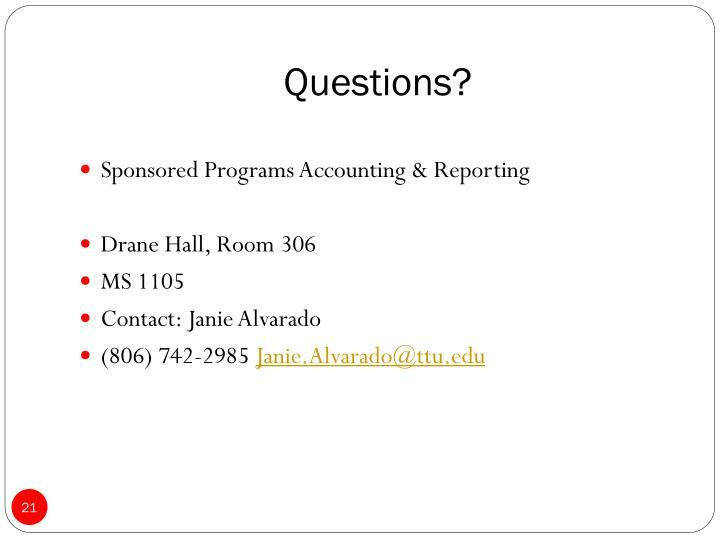 Please contact Sponsored Programs Accounting and Reporting if you are unsure whether a payroll adjustment needs to be made. 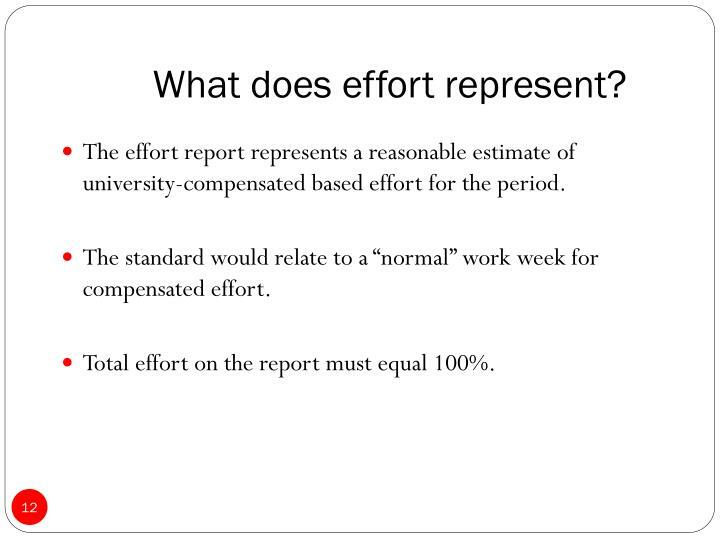 The effort report represents a reasonable estimate of university-compensated based effort for the period. The standard would relate to a “normal” work week for compensated effort. 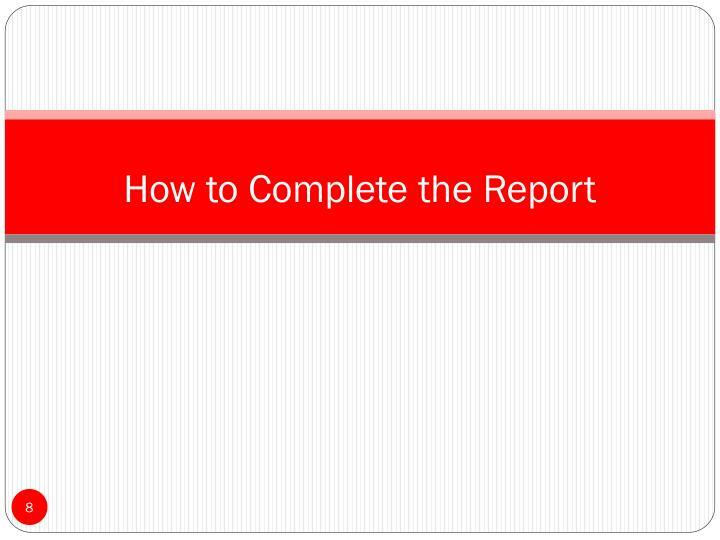 Total effort on the report must equal 100%. If you work more than forty hours per week do you still record 100% effort? 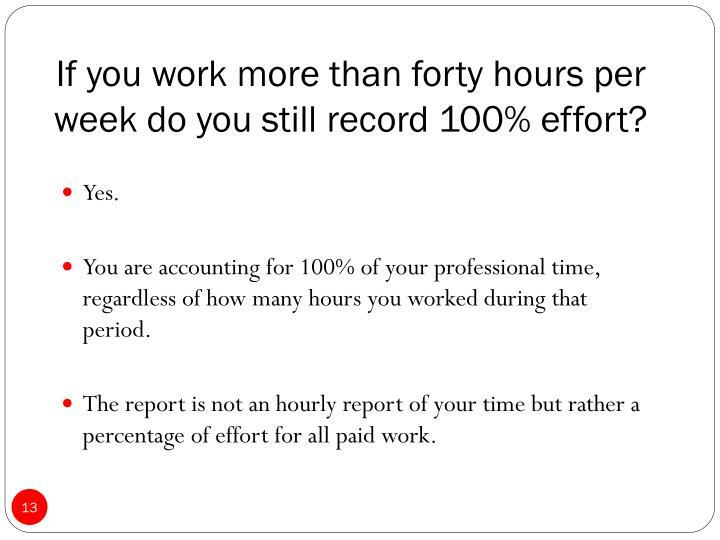 You are accounting for 100% of your professional time, regardless of how many hours you worked during that period. 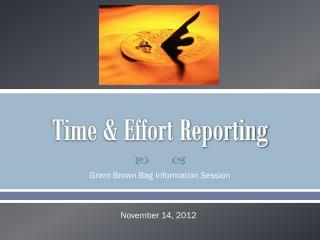 The report is not an hourly report of your time but rather a percentage of effort for all paid work. 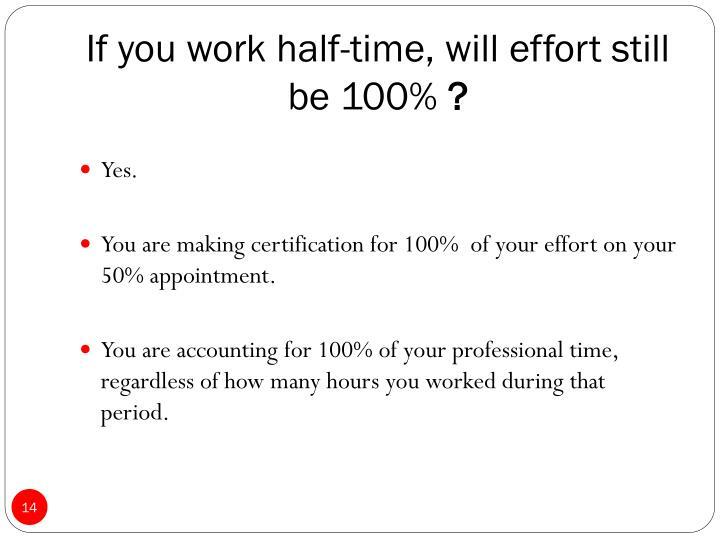 If you work half-time, will effort still be 100% ? 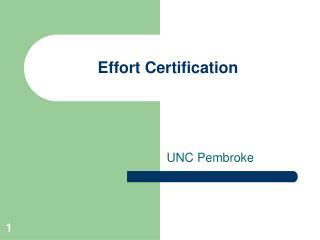 You are making certification for 100% of your effort on your 50% appointment. 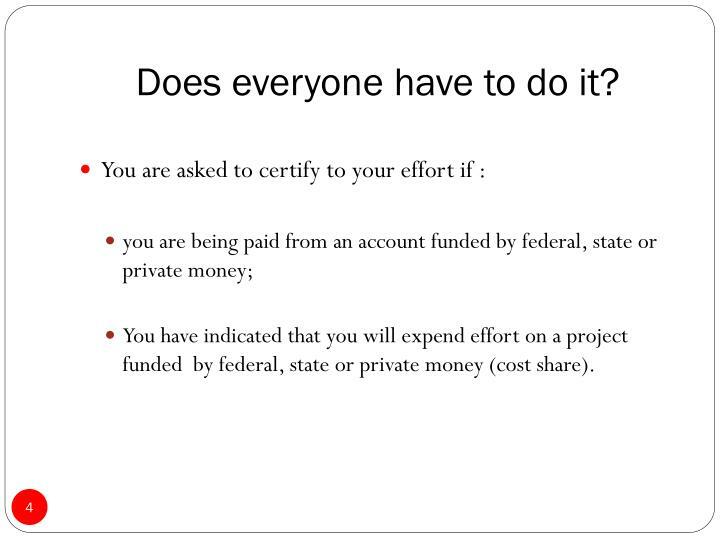 If a faculty member expends effort on a sponsored research project but does not charge the project for all (or any) of his or her salary for that effort, the entire effort must still be allocated to the project. 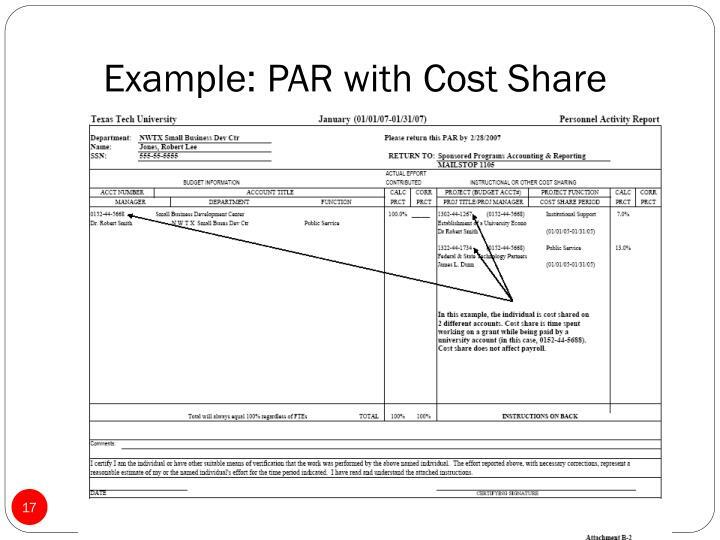 The unfunded effort is generally considered cost sharing and is recorded in the right hand column of the PAR. Cost shared salaries must be verified as well. If a cost share salary percentage differs from actual effort by more than 5% of total effort, report the correct total, and call SPAR to see if a payroll adjustment may be necessary. 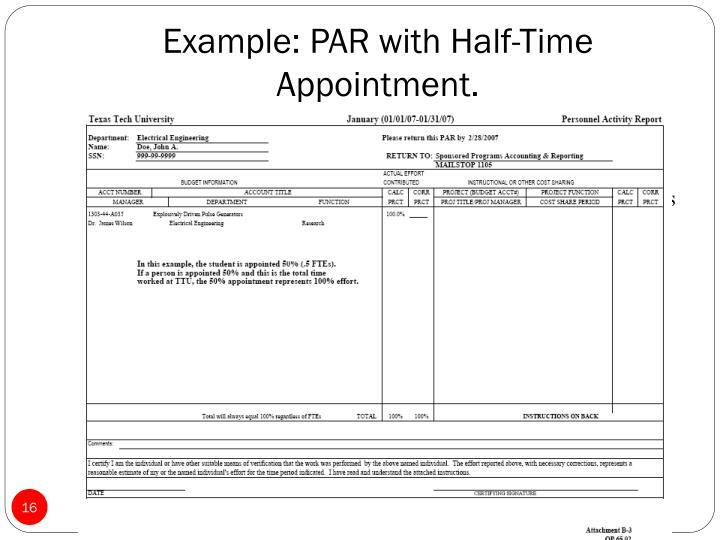 Example: PAR with Half-Time Appointment. For example, if a faculty member expends 75% of his or her total effort on a sponsored project, but the sponsor is charged for only 50% of his or her salary, the preprinted percentage for that project on the Effort Report would be 50%. 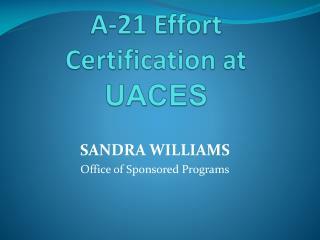 To present an accurate picture of actual effort expended on the project, the faculty must enter 25% in the Sponsored Research column of the departmental account in addition to the 50% in the Sponsored Research column of the Grant Account. 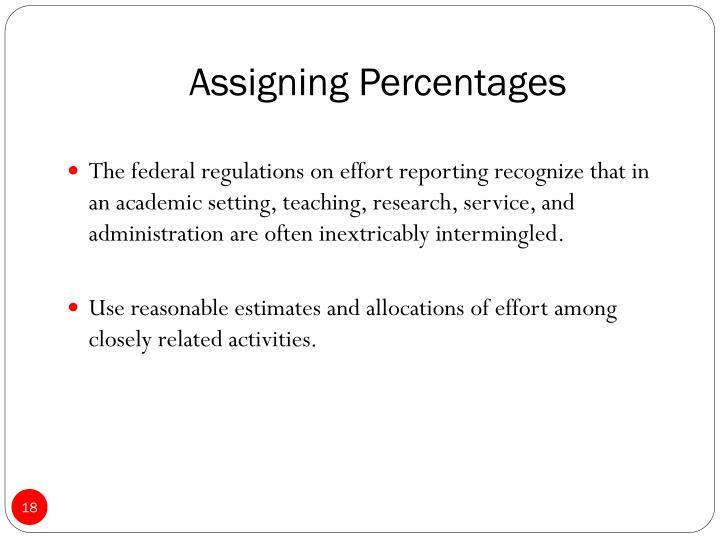 The federal regulations on effort reporting recognize that in an academic setting, teaching, research, service, and administration are often inextricably intermingled. 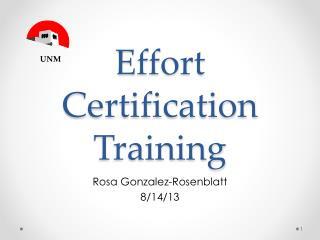 Use reasonable estimates and allocations of effort among closely related activities. 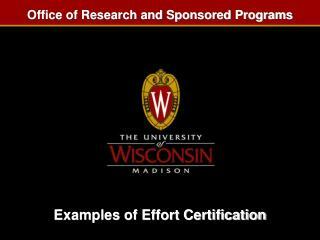 Who should sign the effort certification? 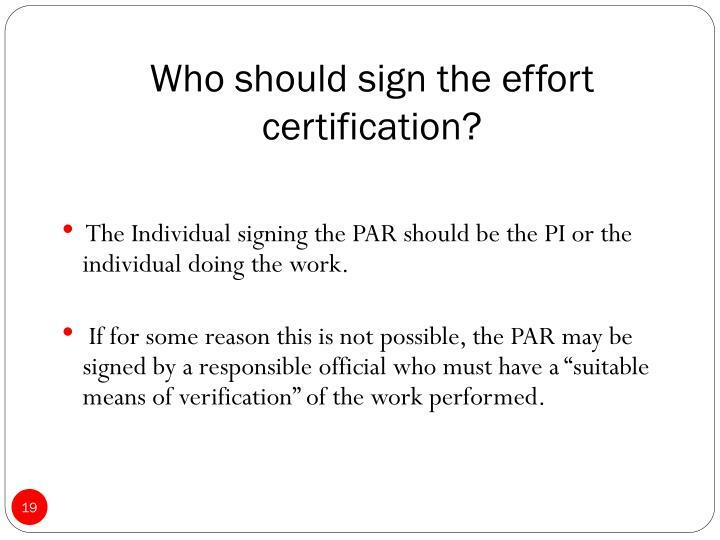 The Individual signing the PAR should be the PI or the individual doing the work. 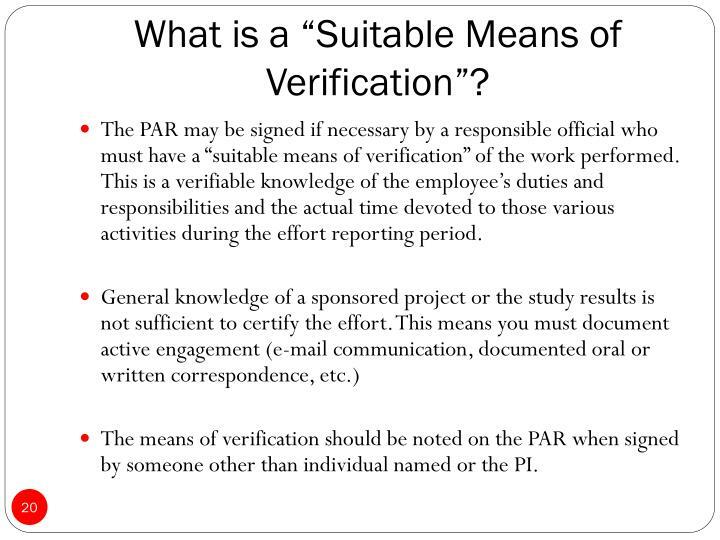 If for some reason this is not possible, the PAR may be signed by a responsible official who must have a “suitable means of verification” of the work performed. What is a “Suitable Means of Verification”? The PAR may be signed if necessary by a responsible official who must have a “suitable means of verification” of the work performed. This is a verifiable knowledge of the employee’s duties and responsibilities and the actual time devoted to those various activities during the effort reporting period. The means of verification should be noted on the PAR when signed by someone other than individual named or the PI. 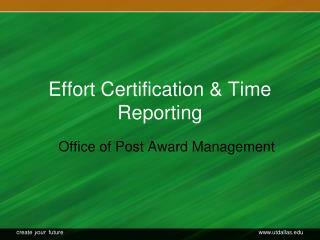 Time and Effort Reporting for Federal Grants -. 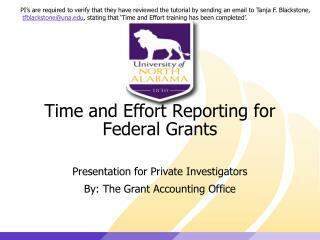 presentation for private investigators by: the grant accounting office. 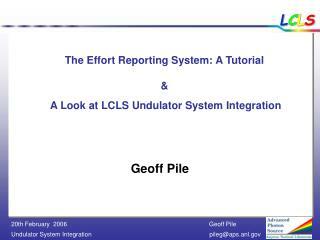 pi’s are required to verify that they have reviewed the tutorial by sending an email to tanja f.
A Practical Approach to Managing Effort Reporting Impacts from Cost Transfers -. 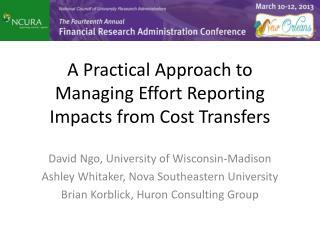 david ngo, university of wisconsin-madison ashley whitaker, nova southeastern university brian korblick, huron consulting group. agenda what are cost transfers? 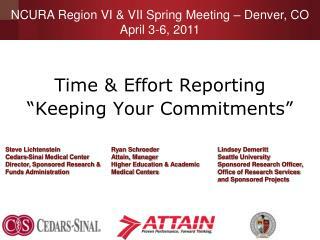 Time & Effort Reporting “Keeping Your Commitments” -Ncura region vi &amp; vii spring meeting – denver, co april 3-6, 2011. time &amp; effort reporting “keeping your commitments”. 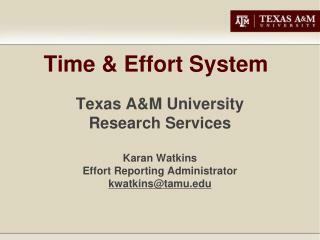 time &amp; effort reporting. agenda.